The Chinese New Year, known as the Lunar New Year, is also called the Spring Festival and it is one of many Asian Lunar New Years that take place across the world. Lunar means that it follows the cycle of the moon -- this festival begins on the second new moon after the winter solstice, which appears between 21 January and 20 February, and ends on the full moon 15 days later, in time for the Lantern Festival. Traditionally it's a time for family reunions and a time to clean the house to sweep out ill-fortune and welcome in prosperity. Red decorations (especially paper cuts), new red clothes and red envelopes full of money for children are some of the ways that people celebrate. Vancouver is home to many people with Chinese heritage and this means that it's a great city to enjoy the colorful celebrations. The Lunar New Year and the Year of the Pig begins on Tuesday, February 5, 2019. 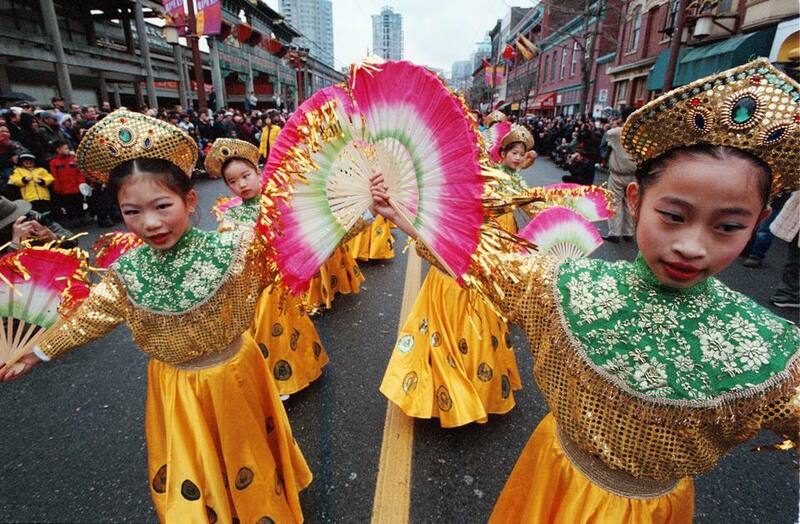 Every year, Vancouver hosts multiple Chinese New Year Events, culminating in the annual Chinese New Year Parade through historic Chinatown, a cultural extravaganza that's one of the city's biggest and best annual parades. Organized by the Chinese Benevolent Association of Vancouver since 1979, the parade has grown into a must-see event in Vancouver, attracting over 50,000 spectators and 3,000 performers, including the largest assembly of lion dance teams in Canada. With more than 50 lions, diverse multicultural dance troupes, the Vancouver Police Department Motorcycle Drill Team, marching bands and more, the Chinese New Year Parade is a celebration not to be missed. Head there early to get a good spot to watch the parade - as it's February in Vancouver you'll need to wear layers and dress warm with a waterproof jacket and umbrella to stay dry! The colorful Chinese New Year Parade in Vancouver takes place on Sunday, February 10, 2019, starting at 11 am. The 1.3-km long route starts at the Millennium Gate on Pender Street (between Shanghai Alley and Taylor Street), proceeds east along Pender Street, turns south onto Gore Street, turns west onto Keefer Street and then disperses on Keefer at Abbott. Like any big, downtown event, driving and parking will probably be extremely difficult. Buses and SkyTrain are the best options. Since so many streets will be blocked off, check Translink for alternate bus routes, or take the SkyTrain to Stadium-Chinatown Station. From there it's an easy walk to the start of the parade in Chinatown. After the parade, which takes around two and a half hours, festivities in Chinatown continue with lion dances and the family-friendly free Vancouver Chinatown Spring Festival-Cultural Fair at Sun Yat-Sen Plaza (50 East Pender Street). Head to the nearby Dr Sun Yat-Sen Classical Chinese Garden for the Year of the Pig Temple Fair (10.30 am to 4 pm). Celebrating the 12th animal in the Chinese zodiac, the pig is a symbol of prosperity, with its chubby cheeks full of good fortune. This family-friendly event includes a wishing tree, ping pong with Frida & Frank, paper cutting pig designs, Dragon Boat BC demonstration, instrument discovery with VSO School of Music, Gong Fu Cha tastings and the 淑芳你好嘛 (Suk-Fong Nay Ho Mah) / Suk-Fong, How Are You? exhibition from artist Paul Wong. Visit between 1.30 pm and 2 pm, and then 3 pm – 3:30 pm for performances by the Azalea Chinese Ensemble from the VSO School of Music. Learn more about Chinese zodiacs in English with Cantonese at 10. 45 am and 12 pm, and in English with Mandarin at 11.15 am and 12.30 pm. From 2 pm until 3 pm you can enjoy a Lion Dance by Mah’s Athletic Association. At the Temple Fair you'll also find the innovative company Edible Projects. They will be serving a slightly modernized version of tang yuan 湯圓 (a glutinous rice dessert), combining a traditional shape with contemporary flavors and textures. End the day at the Chinese New Year Banquet at Floata Seafood Restaurant. Tickets to the banquet start at $38 and include both dinner and live entertainment, lion dances, greetings by the fortune god and a variety show with singing, cultural dances and more. Find out more about Vancouver's other Chinese New Year celebrations and events in our handy guide to 2019's festivities.